If you’re looking for a quick 24 – 48 hour getaway from Berlin, than look no further than Szczecin, Poland. I’ve visited the city so many times, it almost feels like a second home. It’s where I bring people I love to feast on pierogis, sample craft beer, watch a performance at the Philharmonic, and check out the city’s various historic sites. Recommended reading: For a complete guide about how to spend your time in Szczecin, read A Day Trip From Berlin to Visit Szczecin Poland, jam packed with tons of tips. Obviously if you’re coming to Szczecin, Poland for a day or two, you’re going to need a place to get a good night’s sleep. Check out our round-up of the best hotels in Szczecin. For this best hotels in Szczecin list, we’ve taken care to feature properties that are budget friendly and others that are more luxurious. One is set in a historic property, another in a forested park oasis, and others are in modern high rises. A special focus is given to relaxing spa amenities and drool worthy brunches. The three star budget friendly Focus Hotel Szczecin is 750 meters from the city center and within walking distance from the main train station. 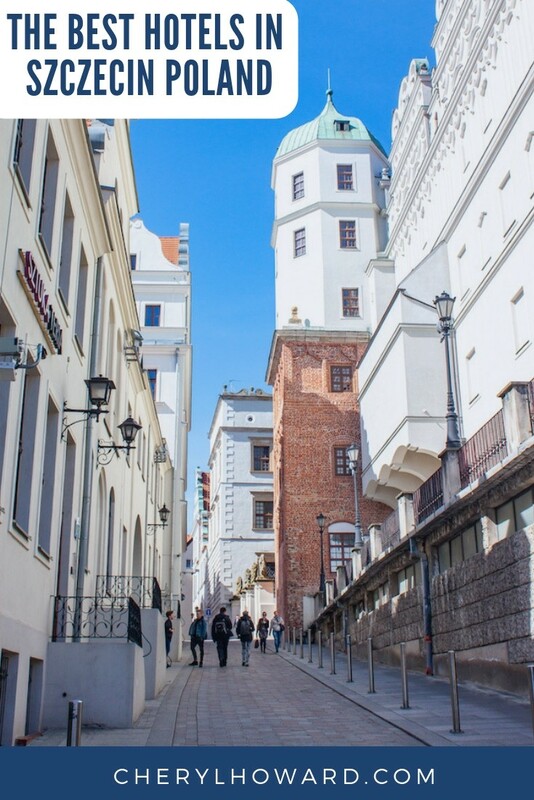 You’ll find yourself close to attractions like Wały Chrobrego and The Pomeranian Duke’s Castle. While not a luxury property, you can expect loads of good stuff like spacious warmly coloured rooms with comfortable beds, flat screen TVs, coffee and tea amenities, free bottles of water, complimentary wifi, an onsite restaurant and bar, and even a fitness center. Online reviewers rate the hotel’s basic breakfast as top notch. Expect prices to range from €50 – €80 per night during peak season. One of Szczecin’s most luxurious and historical properties is Hotel Atrium. This four star hotel, located just over one kilometer from the city center, has only 30 rooms. With an Old World ambience, the building features standard rooms, studios, and large suites. The rooms are bright and airy – some of the suites come with skylights, bathtubs with jets, separate living areas, massive beds, and balconies offering up city views. The onsite restaurant features Italian cuisine in a romantic setting and in the summer, you can enjoy the outdoor terrace. Prices range from €65 – €110 per night during peak season. Novotel Szczecin Centrum is a four star hotel located in the city center, not far from Szczecin’s main bus and train stations. The rooms are decked out with a modern design, with some of them having queen sized beds and both a bathtub and shower. In addition to a trendy hotel bar and restaurant, you’ll find fitness and spa facilities including a pool and sauna. Aside from the usual hotel buffet breakfast, there’s even a chef cooking omelettes and waffles on demand. Expect prices to range from €60 – €90 per night during peak season. Park Hotel is a boutique hotel situated in the center of Stefan Żeromski Park and like the other hotels listed here, isn’t far from the city center and attractions like the Philharmonic. The timeless four star property with more than 100 years of history features large soundproof rooms with the usual amenities and other perks like robes and slippers, free water daily, and flat screen TVs with an extensive channel selection. One of the Park Hotel’s premium features is the hotel spa with a large indoor swimming pool, steam bath, Finnish sauna, whirlpool tub, heated couches, and a cold water barrel for dipping. Another premium addition is the hotel’s restaurant with award winning chef Mariusz Siwak at the helm. Inspired by the slow food movement, Siwak focuses on high-end Polish cuisine with locally sourced ingredients. Take part in one of his seven course tasting experiences to find out what the buzz is all about. Prices range from €90 – €120 per night during the city’s peak season. They might be part of a well known chain, but Radisson Blu Szczecin offers up one of the best four star places to stay in Szczecin. The trendy and modern lobby astounds you from the moment you enter the building with it’s high ceilings and a peaceful water feature. The rooms offer ample space, city views, a flat screen TV, minibar, bathrobe, and even a Nespresso machine. Get your workout in at the gym and then treat yourself – the hotel’s Baltic Spa includes steam/aroma/Osman baths, dry sauna, tepidarium, caldarium, sensation showers, snow cave, and a bubbling jacuzzi. More than 30 treatments like massages, wraps, and facials are also available. There are two bars in the hotel, but we suggest heading up to the 11th floor to enjoy a drink and the view over Szczecin. The breakfast at the Radisson Blu Szczecin is second to none, with lots of different options for you to feast on like smoked salmon. During high season, rooms will cost you anywhere from €60 – €250 per night. Have we missed out on any great hotels in Szczecin? Let my readers know in the comments below. You can get there by train on a second class Berlin Brandenburg ticket for €29. The price includes the round trip fare for up to five people. Depending on your connection, the journey will take anywhere from two – three hours. The bus is fairly cheap as well, averaging anywhere from €15 – 20 for a round trip fare for one person. The bus trip will take about three hours if traffic is light and construction zones are few. Driving from Berlin to Szczecin will take you a little under two hours. 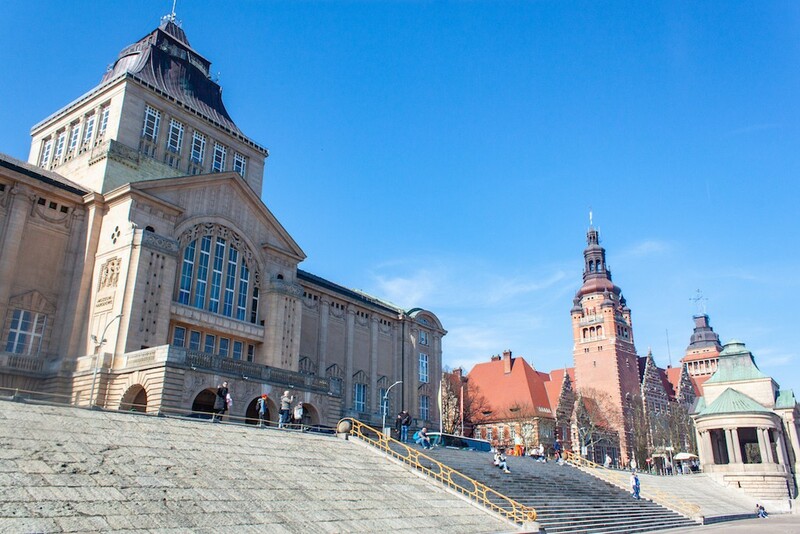 2) Most trains and buses will take you to Szczecin Główny, the city’s main train station. From there, you can easily reach most of the hotels highlighted above within 20 minutes by foot. To find out information about other transport options, check out Wikitravel. Check xe.com to find out how the złoty fares against your local currency. Your money will go a long way in Szczecin as prices are lower here than in other European cities. It’s easy to get by without cash, as you can use bank or credit cards in most places. However, if you’re desperate for some cash, there are plenty of bank machines around. When you pay by card, you’ll be asked which currency you want to pay in – złoty or euros. Choose to pay in local currency, as you’ll save money on the exchange rate. 4) Want to discover even more of Szczecin? Book a city tour now. 6) Looking for other places to stay when you visit Szczecin that aren’t listed out above? Check out more options on booking.com. 7) If staying in a hotel is not your thing, book an Airbnb apartment. First time Airbnb users, use this link to score a€34 travel credit. 8) If you want to get around Szczecin easily, why not rent a car? Download this Google Map to keep track of locations for the best hotels in Szczecin. 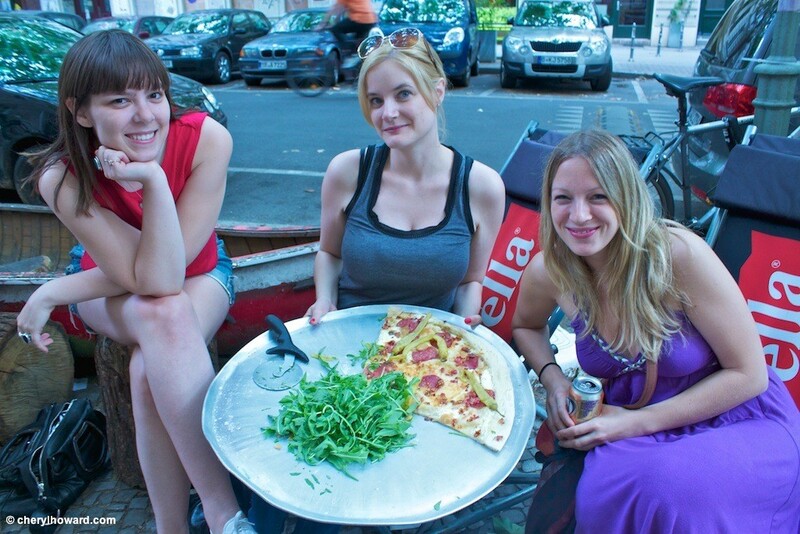 Celebrating Canada Day In Berlin … With Canadian Pizza!?! ?